First a brief back-story. Today at the cash register I had some down time, so I picked up a book to read from the Choice Books rack. It was “Do Hard Things,” by Alex and Brett Harris. I have had terrible luck with the Choice Books rack in the past, finding nothing but ill-researched and fluffy romance novels, and “self-help books that place pleasing yourself as top priority in your life. But “Do Hard Things” actually looks promising. End of brief back story. 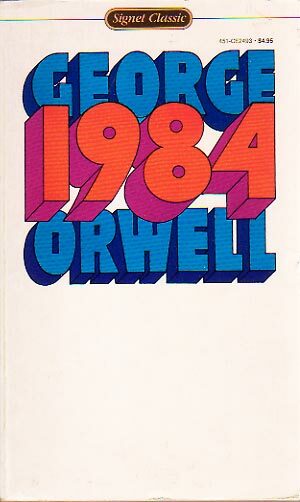 1984 is set in the year 1984, as implied by the title, but as it was published in 1949, at the time it was a book on what the future could look like. Sort of like your modern post-apocalyptic books. The story centers around a man named Winston. The very first page describes him walking into his apartment complex and seeing pictures of “Big Brother,” the President/King/dictator figure in the world where he lives. A few pages on and you learn that Winston, as well as most of the people in the country, are being watched all the time by TV-type things called “telescreens” which not only allow you to watch programs, but also allow you to be watched virtually all the time. It doesn’t take long before more bizarre things about Winston’s world are revealed. The government basically controls everything. If the government says that 2-2=5, then you better believe that 2+2=5 or else you have committed a thoughtcrime. The government can have someone killed and then say that they never existed, and all historical documents which include that person will be destroyed or altered. Winston’s job, actually, is altering these documents. Winston, as hero of the novel, rebels against the system. He falls in love with a girl named Julia who has similar ideas to his, although isn’t quite as intellectually minded. Together they work to beat the system. Originally, that’s what I thought the novel was going to be about; beating the system. I was over halfway through the book before I realized that the novel isn’t about beating the system, it’s about being beaten by the system. Generally, the book is well plotted and not too difficult to read, except for one very boring part in which Winston is reading another book which is describing all the flaws and intricacies of the bizarre political system he lives in. Those pages were boring enough that I had to read them over a few times because I kept zoning out. I finally just skimmed them–sort of like trying to read a really intellectual blog—but the rest of the book was easy to read. I am 98% sure that 1984 is at your local library, and I think you should read it. It is interesting, not happy, but it makes thinking about politics and political control interesting. The one thing to remember is that how close we have come to that type of society and that now we are taking a lot of that for granted. and its not just about beating the system its recognizing that there IS a system. Way back when a person could just leave the house and disappear. Now its much harder and much more difficult. Unless a person lives off the grid is every move is tracked. I’m really excited that you are doing book reviews. I’ve noticed that your book list features a wide variety of books so I am looking forward to getting some new book ideas! May I recommend a book? It’s called “Across the China Sky” by Hope Flinchbaugh. (writer for Voice of the Martyrs) This fiction book is based on true events in the life of Christians in China. I don’t want to ruin it for you, but I will say that it involves a lot of mystery, suspense, and moments that honestly made me want to pray for the characters in dangerous situations. The stories of these Christians will break your heart, but have inspired me to want to make a change. I am blown away by the courage displayed by each character and would gladly read this book again….something I rarely do! Do hard things Is A fantastic book! I have read it, and I gave it to some friends. I loved it! HEY LOVE THE MOVIES THEY WERE SO CUTE AND JENNY WAS SO LITTLE. hEY U AND JENNY SHOULD COME OVER AND HANG OUT SOME TIME AND MAKE A MOVIE. THAT WOULD BE REALLY FUN.